This article or section does not adequately cite its references or sources. The AC-130 gunship is a heavily-armed airplane manufactured by Boeing and Lockheed as a variant of the C-130 Hercules transport plane. The AC-130 is mainly used by the United States Air Force, which uses AC-130H Spectre and AC-130U Spooky gunships powered by four turboprops and featuring armament ranging from Gatling guns to howitzers. The AC-130 is over 97 feet long (almost 30 m) with a wingspan of over 132 feet (over 40 m). The standard crew of thirteen includes officers (pilots, a navigator, armament officers, etc.) and enlisted staff (flight engineer, aerial gunners, etc.). The US Air Force uses the AC-130 gunships for close air support, air interdiction, and force protection. Close air support roles include supporting ground troops, escorting convoys, and flying urban operations. Air interdiction missions are conducted against planned targets and targets of opportunity. Force protection missions include defending air bases and other military facilities. The gunship squadrons are part of the Air Force Special Operations Command. These heavily-armed aircraft incorporate side-firing weapons integrated with sophisticated sensors, navigation and fire control systems to provide targeted firepower or area saturation fire with the 40 mm cannons. The AC-130 can spend long periods flying over their target area at night and in adverse weather. The sensor suite consists of a television sensor, infrared sensor, and radar. These sensors allow the gunship to visually or electronically identify friendly ground forces and targets in most conditions. The AC-130U is equipped with the AN/APQ-180, a synthetic aperture radar for long-range target detection and identification. The gunship's navigational devices include the inertial navigation systems and Global Positioning System. The AC-130U employs technologies developed in the 1990s and can attack two targets simultaneously. It also has twice the munitions capacity of the AC-130H. 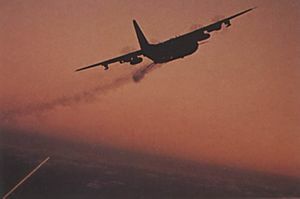 During the Vietnam era the AC-130 was sometimes equipped with a Magnetic Anomaly Detector (MAD), a highly sensitive passive device which picks up localized deviations in earth's magnetic field and is normally used to detect submerged submarines. The MAD array of the C-130 could detect the ignition coils of enemy trucks hidden under dense foliage, alerting the crew to their presence. 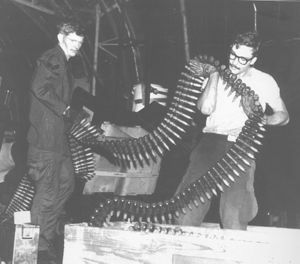 Weapons fire during a night mission. The AC-130 gunship has a combat history dating to the Vietnam War, where it replaced the AC-47 (nickname Puff the Magic Dragon) and the AC-119. Whereas forward-firing warplanes can only fire during the short time of the firing pass, side-firing gunships can circle the ground target, firing continuously, enabling a greater number of enemy units to be engaged and destroyed. Also, a side-firing gunship spotting a fast-moving target (such as a truck) can attack more quickly, as it doesn't need a separate approach and firing pass maneuver: it simply turns to the enemy and takes aim. In Vietnam, gunships destroyed more than 10,000 trucks and participated in many crucial close air support missions. During the Invasion of Grenada (Operation Urgent Fury) in 1983, AC-130s suppressed enemy air defense systems and attacked ground forces enabling the successful assault of the Point Salines Airfield via airdrop and air land of friendly forces. The AC-130 aircrew earned the Lt. Gen. William H. Tunner Award for the mission. AC-130s also had a primary role during the United States invasion of Panama (Operation Just Cause) in 1989 when they destroyed Panama Defense Force headquarters and numerous command and control facilities. Aircrews earned the Mackay Trophy for the most meritorious flight of the year and the Tunner Award for their efforts. During Operation Desert Storm, AC-130s provided close air support and force protection (air base defense) for ground forces, and battlefield interdiction. The primary interdiction targets were early warning/ground control intercept (EW/GCI) sites along the southern border of Iraq. The first gunship to enter the Battle of Khafji helped stop a southbound Iraqi armored column on 29 January. One day later, three more gunships provided further aid to Marines participating in the operation. The gunships attacked Iraqi positions and columns moving south to reinforce their positions north of the city. 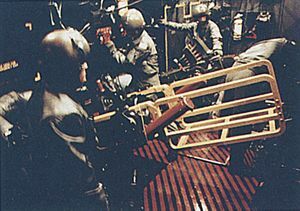 During the early morning hours of 31 January 1991, a surface to air missile (SAM) shot down aircraft #69-6567 (call sign Spirit 03) while it provided fire support to the Coalition Marines. All 14 crew members perished. The military has used gunships during Operations Restore Hope and United Shield in Somalia, in the NATO mission in Bosnia-Herzegovina, and in the 1997 evacuation of American noncombatants in Albania. Gunships also were part of the buildup of U.S. forces in 1998 to convince Iraq to comply with U.N. weapons inspections. The United States later used gunships later during the 2001 invasion of Afghanistan, and the Iraq War. In 2007 US Special Operations forces used the AC-130 in attacks on suspected al-Qaeda militants in Somalia.. The AC-130H is produced at a cost of US$132.4 million, and the AC-130U is produced at a cost of US$190 million (fiscal 2001 constant dollars). Currently there are eight AC-130H and thirteen AC-130U aircraft in active duty service. The AC-130 gunship series is expensive to maintain due to the wide variety of equipment installed. The heat signature reduction components alone are a cause of consternation to aircraft mechanics and have become almost legendary among maintenance personnel for their inability to properly diffuse engine exhaust temperatures without warping or cracking. "Gunship History" from the Spectre Association website. AC-130A aircraft names, tail numbers and current locations (if applicable), also from the Spectre Association website. Air Force Factsheet: the AC-130H/U GUNSHIP on which this article was originally based. This page was last edited on 6 March 2007, at 12:47.